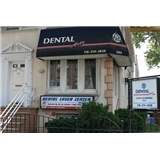 Dental Arts of Brooklyn (Brooklyn) - Book Appointment Online! Our mission is to provide a safe, friendly and trustworthy practice that delivers high quality dental treatment and creates a happy, healthy and enjoyable atmosphere. We feel that one of the most important ways to achieve dental wellness is through prevention and patient education. Our office combines modern dentistry with old fashion personal attention. In our clean modern, office the friendly staff is well trained in all aspects of dental treatment such as: mercury free white tooth colored fillings, painless root canals, crowns and bridge work, non-surgical laser dental treatment, teeth whitening and many others. Dr. Liem gave me back my smile! I'm so happy! Dr. Liem, his assistants/nurses and office staff are all very caring! I felt very comfortable. Everyone was so friendly. I would definitely recommend this dentist to my friends and family.